Nowadays most of us have become too much of health conscious... not only that we always want to lose some of our weight to become healthy an fit. 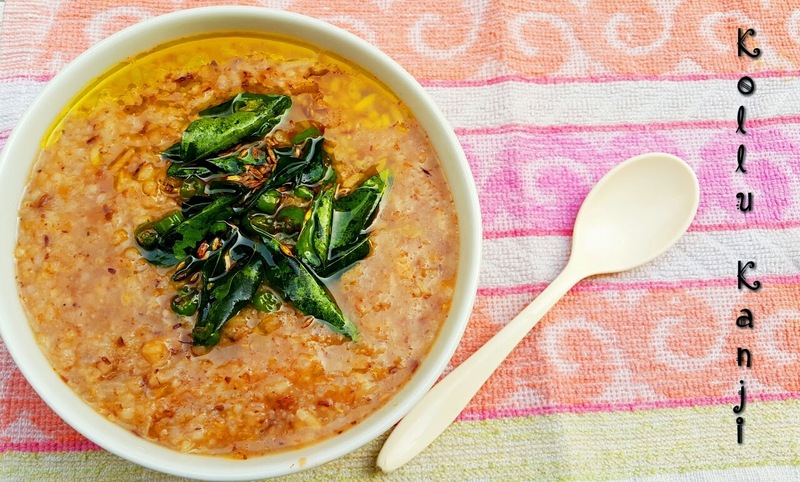 The main ingredient in this recipe has always been used by the Indians for the reduction of extra weight and there is a Tamil saying also which translated goes like this "sesame is for the people who wants to put on some weight and kollu / horsegram is for the ones who want to reduce the weight". Dry roast the kollu and add it to the blender and run till its broken little. 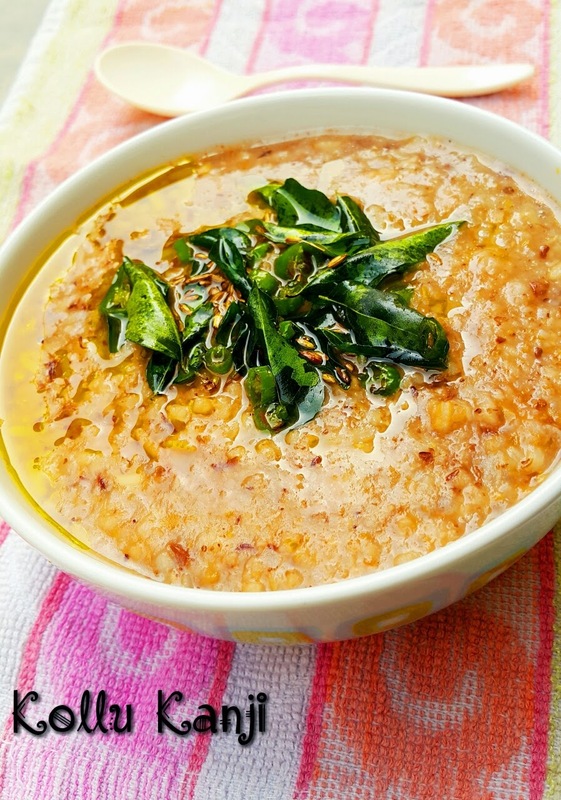 Add the broken kollu with the washed rice and add the chopped onion, green chilli, garlic salt and grated coconut if using and add the 5 cups water to it and cook it in a pressure cooker for 10 whistles. After the pressure has reduced remove the kanji from cooker and check for salt and add if more needed. Add the ingredients "To Temper" and add it to the kanji and serve hot. 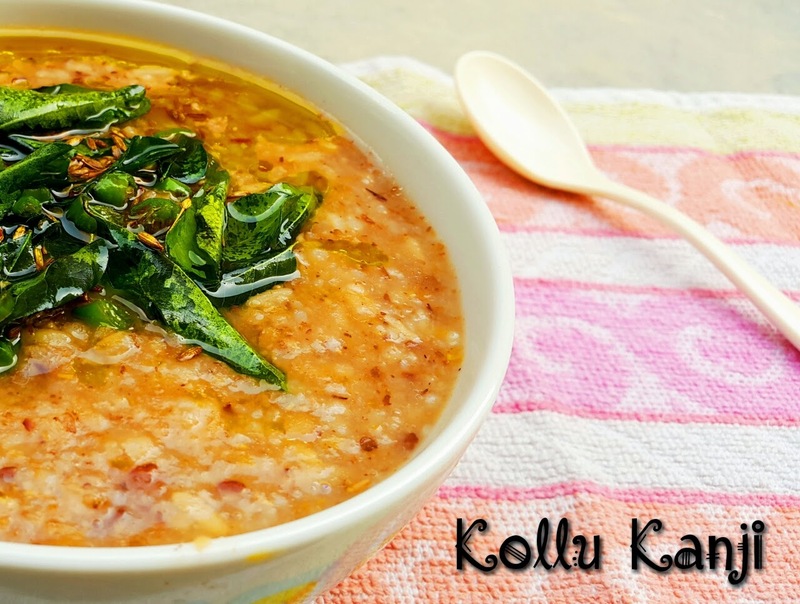 Adding Kollu / Horse Gram To your diet once a week will be very beneficial. This makes a great lunch or dinner. wooooooooooooooooooow this is so simple ! a boon to us bachelors i wll try this Maa'm n tell u how it came out! many mny thanks! Am happy that this post was useful to you. You can send me your recipe request or the pictures of the recipes you try from here to my www.facebook.com/passionatecooker or Email me to passionatedcook@gmail.com.